On 26 June Alexandria Ocasio-Cortez achieved a sensational victory in the primary election to be the Democratic Party’s candidate for New York’s 14th Congressional district at this November’s midterm elections. 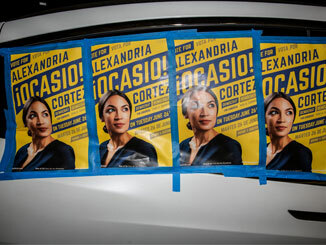 Her victory points to a wider trend in the US – an advancing and insurgent left, which entered the political stage when Bernie Sanders sought the Democratic nomination to run for President in 2016. Ocasio-Cortez is a member of the Democratic Socialists of America, on the left of the Democratic Party and she toppled the 19 year incumbent Joseph Crowley, winning with 57% of the vote. Crowley is a senior figure on the right wing of the Democratic establishment who is chair of the House Democratic Caucus. Locally he has been chairman of the Queens County Democratic Party for over 10 years. Ocasio-Cortez stood on a left agenda – free healthcare for all, a $15 minimum wage, the abolition of US Immigration and Customs Enforcement (ICE), gun control, tuition free public colleges and trade schools and an end to private prisons. She supports the Palestinians, opposes US wars and champions action to stop climate change. She also said: ‘Our campaign was focussed on just a laser-focused message of economic, social, and racial dignity for working-class Americans, especially those in Queens and the Bronx.’ One of the slogans from her campaign literature was ‘Es la hora de uno de nosotros’ (‘It’s time for one of us’) – reflecting the fact that as a Latino, Ocasio-Cortez candidature is about giving the majority Latino population in the 14th New York district a voice in Congress. Senator Bernie Sanders himself, is continuing to play a very prominent role in US politics. He recently voted against Trump’s increase in military spending, has been vocal in his support for Palestinian human rights during Israel’s assault on peaceful protesters in Gaza and continues to prioritise a the fight to defend the living standards of the US population. Other allies of Bernie Sanders are also advancing within the Democrats. A group that emerged out of Bernie Sanders’ Presidential campaign of 2016, Our Revolution, has achieved notable successes in the Democrat primaries. Our Revolution has endorsed 33 candidates in the House Democratic primaries held this year and has won in 14 of these contests, including in New York 14th district. Three of these wins are in seats that are considered ‘safe Democratic seats’, whilst 10 have come in districts currently rated as safe Republican seats. Ocasio-Cortez’s victory is the only one in which a Democrat establishment incumbent has been defeated. In the 19 primaries where the right wing Democrat establishment did win, 11 are key congressional battlegrounds. There is no doubt that the Bernie Sanders wing of the Democrats is advancing. Other advances include three progressive women being selected as Democrat candidates for the Pennsylvania House of Representatives. Summer Lee, Sara Innomorato and Elizabeth Fielder were endorsed by the Democratic Socialists of America and won decisive primary victories over establishment Democrats. Membership of the Democratic Socialists of America has been rising. Since 2016 and the Bernie Sanders campaign it had grown from 7,000 members to 37,000. Following Ocasio-Cortez’s victory, membership increased to 40,000. The left radicalisation in the US is particularly strong amongst young people. Of the tens of thousands of people who have joined the Democrat Socialists of America since November 2016, 70-80% of them are under 35. The median age of the Democratic Socialists of America has fallen from 68 in 2013 to 33 now. Attitudes of young people are affected by their increasingly precarious material situation, with the rising cost of education, the unreliability of health insurance and job insecurity. A recent survey of young Democrats, aged 18-32, found that 61% view socialism positively. The radicalisation on the right wing, led by the Trump presidency and his ‘alt-right’ supporters, is the dominant force in US politics. But the insurgent left that Bernie Sanders led in 2016 has not disappeared. It is a minority that is strengthening and scoring victories within the Democrats.